The Phonic AM 85 is a compact analog mixer with 2 mono and 2 stereo channels that's ideal for use in homes, project studios, and presentations where high-quality audio is the primary concern. 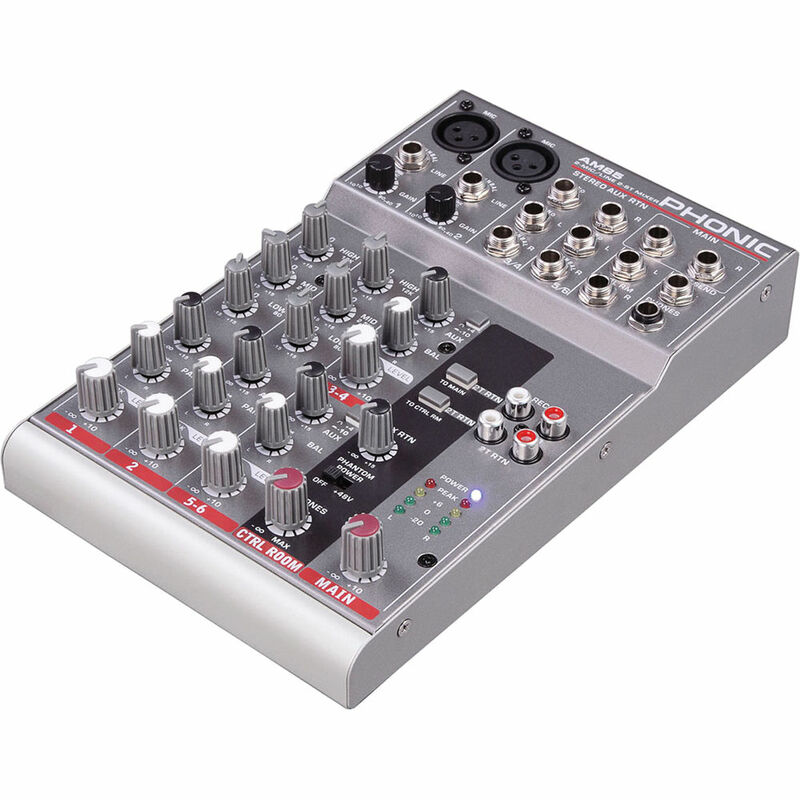 This mixer has two mic/line mono input channels with balanced XLR and 1/4" connectors, four 1/4" (equals 2 stereo) line input channels, a 3-band EQ for shaping each mono channel's tone, and pan/balance knobs. Globally selectable 48 VDC phantom power allows proper operation of condenser microphones. The low-noise circuitry and simple design of the AM 85 contribute to commendable audio quality and user-friendly functionality. The mixer's two stereo input channels are equipped with 1/4" connectors for compatibility with stereo sources such as keyboards and DJ mixers. Utilize the mono aux send and stereo aux return to integrate your own external effects processor such as a hardware reverb or delay. There are 1/4" main, control room, and headphone outputs with two independent volume controls, and dual 4-segment LED meters that clearly indicate your master output level. Patch an additional stereo source into the RCA inputs, then route it to the main outputs, control room outs, or both. The stereo RCA output is handy for recording your mix to an external device such as a cassette deck or computer soundcard.